Ginkgo Tree: To Prune or Not to Prune? 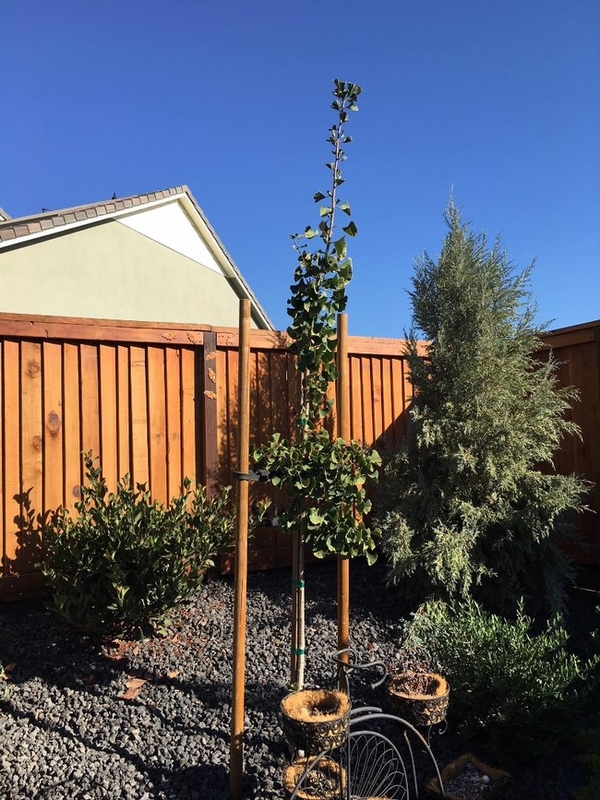 Client's Request: This ginkgo tree (right) was planted Jan 2018, but it's probably a little older. I'm not happy about the long thin growth. Would it encourage lateral growth if I topped it at about the height of the pole at the right of the tree? If so should I wait until winter when all leaves are shed ? Suggestions? MGCC Help Desk Response: Thank you for contacting the UC Master Gardener Program Help Desk with a question about pruning your ginkho tree. Ginkgos (sometimes known as Maidenhair Tree) are an ancient tree from China related to conifers. They are long lived and generally do not need a lot of pruning. There are different varieties of ginkgos with different growth characteristics. For instance 'Autumn Gold' is an upright grower to 45', eventually spreading to 35' wide. 'Golden Colonnade' is narrow, at 45' tall and 25' wide. 'Presidential Gold' is broadly oval, reaching 50' tall and 40' wide. 'Saratoga' resembles 'Autumn Gold' with a distinct central leader. (This information is from the Sunset Western Garden Book.) If you know what variety you planted, that might help you understand your tree's growth pattern. "Topping" is almost never a recommended tree pruning option, is rarely appropriate, and can be disastrous for the tree. Ginkgos are no exception and should have only one leading trunk from the bottom to the top. This means you should not shorten the tall growth, but rather leave it and wait for branches to grow from it. The best time to prune ginkgos is in late fall or winter during the dormant season. This link from SF Gate describes how to prune a ginkgo tree: https://homeguides.sfgate.com/prune-ginkgo-tree-20450.html. Ginkgo are not usually bothered by insects or diseases, and are very tolerant of heat and alkaline soil. For more information about ginkgos: http://ipm.ucanr.edu/PMG/GARDEN/PLANTS/maidenhair.html. Please don't hesitate to contact us again if you have more questions.